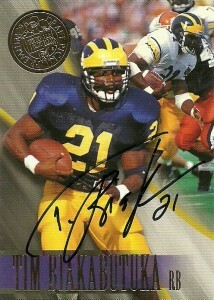 Tim’s name was etched into the Michigan Wolverine’s record books after he rushed for 313 yards on 37 carries, destroying the Buckeyes singlehandedly during the 1996 season. He set school marks for rushing in a single season with 1,818 yards. After his incredible Junior season he declared for the NFL draft. Biakabutuka finished his career at Michigan with 2,810 yards on 472 carries, and 24 touchdowns- despite fighting Michigan star Tyrone Wheatley for playing time. The Carolina Panthers had been searching for an identity at runningback since their inception the previous year in 1995. 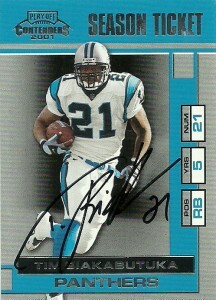 With the 8th overall pick that year Carolina took Biakabutuka, two slots after Lawrence Phillips. Tim then quickly became the team’s first extended holdout, but eventually signed a 4 year deal where he was immediately crowned the unquestioned starter at runningback . His rookie season did not turn out as well as he expected, as after 4 games Tim blew out his knee and was out the rest of the season. In the meantime Anthony Johnson ran for over a thousand yards in his stead and took over the starting role in 1996. Tim quickly got buried on the depth chart behind Fred Lane as the injuries limited Tshimanga to just 2 starts in 1997, and 3 starts in 1998. Biakabutuka’s best season came in 1999, as he ran for a career high 718 yards and 6 touchdowns. He’d follow up his breakthrough year with another 627 yards rushing, and a career high 341 yards on 34 receptions. Tim’s career came to a grizzly end in 2001 though, where in a game against the Redskins he ripped every ligament in his foot. The injury was so gruesome that doctors considered amputating his foot. He luckily survived without the amputation, but his career was over. Despite never starting a full slate of games over his 6 seasons and 35 starts, Tim finished as the Panthers’ career leading rusher, (since surpassed). After retirement he has gone into business as a restaurant entrepreneur, primarily in North Carolina.